As Google gets more and more user-oriented, reviews are becoming increasingly important in how people decide which service to use. One of the most decisive factors in what makes people trust a business is the aggregate review rating. 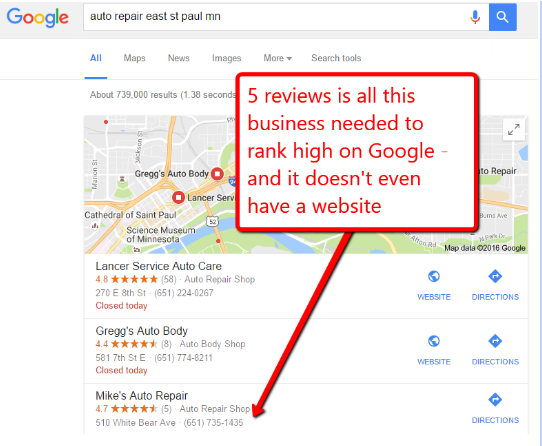 When it comes to Google reviews, there seems to be a minimum number that all businesses should have. Not three, not twenty – but at least five. That’s mainly because people tend to spend more time reading reviews now than they did in the past – and you’ll see just how much going from three to five reviews can influence your conversion rates. According to a recent brightlocal.com survey, only about 32% of consumers form an opinion about a business by reading less than three reviews. On the other hand, up to 70% will have made an impression by reading no more than 6 reviews. This translates to an interesting fact: by simply going from three to five reviews, your business will be able to make a solid impression on twice more potential customers. And considering more than 70% of the customers who form a positive impression of a business will follow with either a website visit or a business contact, this means you’re in for some serious growth. That’s simply from going to three to five Google reviews. There’s one thing you need to understand about how people decide which business is credible and which isn’t. The general pattern is that the more positive the general review rating is, the more people tend to trust that business. Overall rating plays a huge role in how people decide which website to click on – in fact, it’s even more important than the total number of reviews. Again, this means that a bare minimum of five will give you a decent chance even against competitors with more review if your overall score is high enough. Not perfect, though. A perfect 5/5 might trigger a warning signal with some customers – 30% of consumers consider all-positive reviews fake, if there are no negative (or at least moderate) reviews for that specific website. In fact, an astounding 79% of customers need between three and four stars to create a positive impression of a given business. Finally, another factor that plays a part in the way people judge an online business is how it responds to customer reviews. Whether or not a business has responded to negative reviews counts towards overall business credibility for about 20% of potential customers – this means you could be losing as many as one in five customers simply by not responding to negative feedback. Apparently, how many reviews your online business has doesn’t count that high in what makes people click on it. That’s why having as few as five can still generate solid conversion. According to the BrightLocal Survey, the overall star rating is the most important factor (58%), followed by the sentiment of reviews (47%), recency of reviews (41%) and quantity of reviews (35%). This means that having recent reviews of an overall high star rating with positive comments is much more important than simply having tons of old, rating-only reviews. The main points you should take home are the following: having about five reviews will generate an almost double number of potential visitors, while overall star rating counts more towards building credibility than the sheer number of reviews. 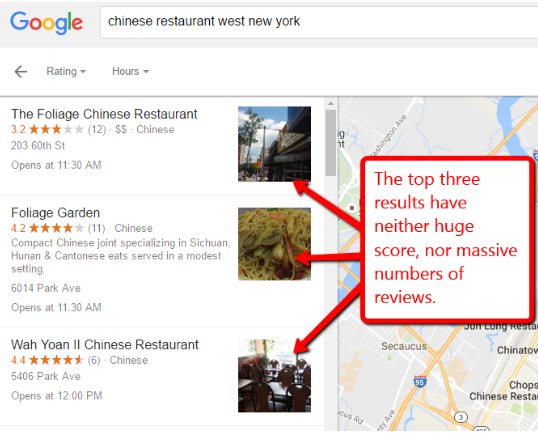 As you can see, the top three results have an average score which is lower than 4 stars – though there are other restaurants that 5-star star reviews – and an average review number of only about 9 – though there are restaurants with more than 100 reviews. This tells us something about how Google decides which businesses make it to the top of the review list. It’s neither those with the highest amount of reviews – it’s pretty easy to buy fake ones, after all – nor those with the highest ratings. Like we’ve seen, people don’t trust perfect feedback, and they don’t necessarily go for the website with hundreds of reviews. 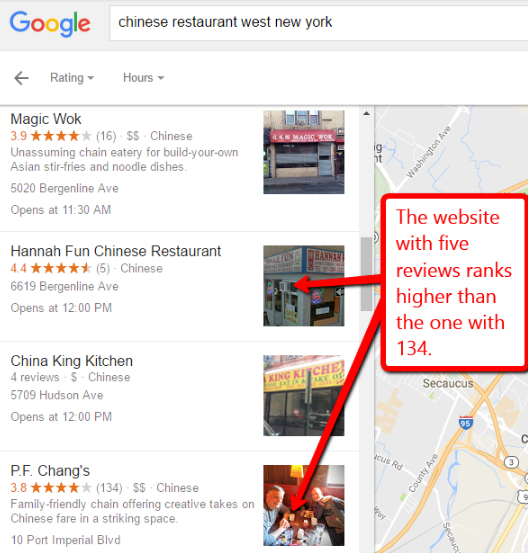 If Google averages business interaction – either website click or directions request – then our guess is that the business with five reviews has a higher average than the one with one hundred. And it actually goes perfectly with the stats we’ve just presented. As you can see, it doesn’t take hundreds of reviews to beat hundreds of reviews. The website who’s got just five ranks two positions higher than the one with 134, and just below the one with 16. Again, this should tell you something about how many reviews you need to make it high on the list. There’s no business on the first page that has less than 4 reviews, but there’s only one that has more than a hundred. In fact, the third, eighth, ninth and eleventh websites all have between four and seven reviews – this means that with a bare minimum of five you can rank high for any keyword in your local area. And the surprising thing is that even if you aim for a larger region – say, the whole New York – you should still do pretty fine with less reviews than you might have thought. 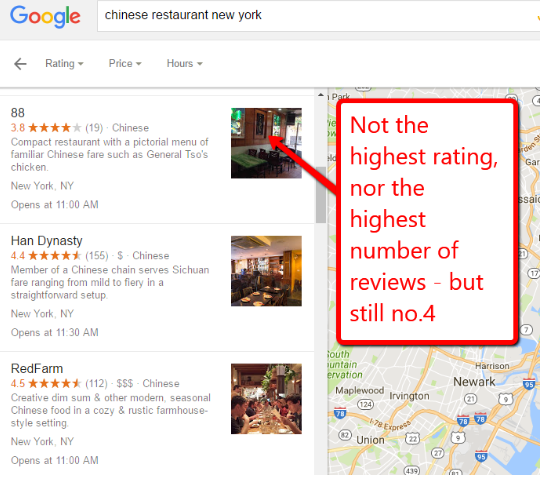 The fourth website for “chinese restaurant new york” only has a modest rating of 3.8/5 out of 19 reviews – but it ranks higher than other websites with hundreds of reviews and a much higher rating. Again, this shows that overall credibility is much more important than sheer rating and review numbers. 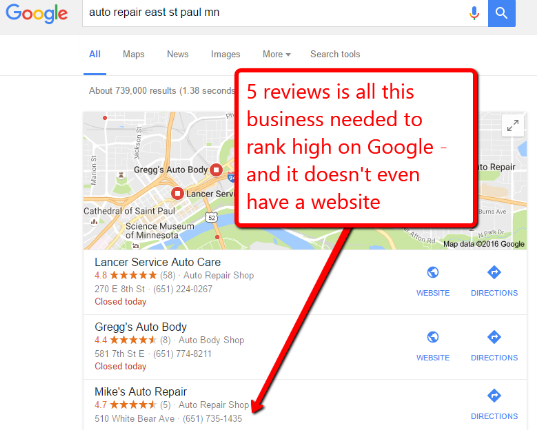 When it comes to Google credibility, all local businesses should aim for at least 5 positive reviews. We’ve seen that this magic number can generate up to twice more potential customers than three reviews would, while being enough to rank as high as third for local searches – and much higher than websites with hundreds of reviews. Credibility is all that matters, and people know websites can boost their reviews through shady means. You need to focus on providing genuine customer quality that will translate in high ratings, rather than waste money on paid reviews. Stacy Brown loves to spend her time rooting for her favorite team (Cubs) and often dives into the digital world. She’s an expert in search engine marketing and is also a content strategist for small businesses. Thank you for sharing this very important tips for Local SEO. I have just started a Local SEO blog for my Local SEO service in our area. This conclusion you have shared regarding Reviews is very menaingful- that “this means that having recent reviews of an overall high star rating with positive comments is much more important than simply having tons of old, rating-only reviews”.